The August issue of Seamwork is up and ready for you to read! This issue is about changes, and not just the ch-ch-ch-ch-changes that David Bowie sings about (although you should probably start by reading Betsy Blodgett’s article on Bowie’s style) but also the creative changes that sewing brings. 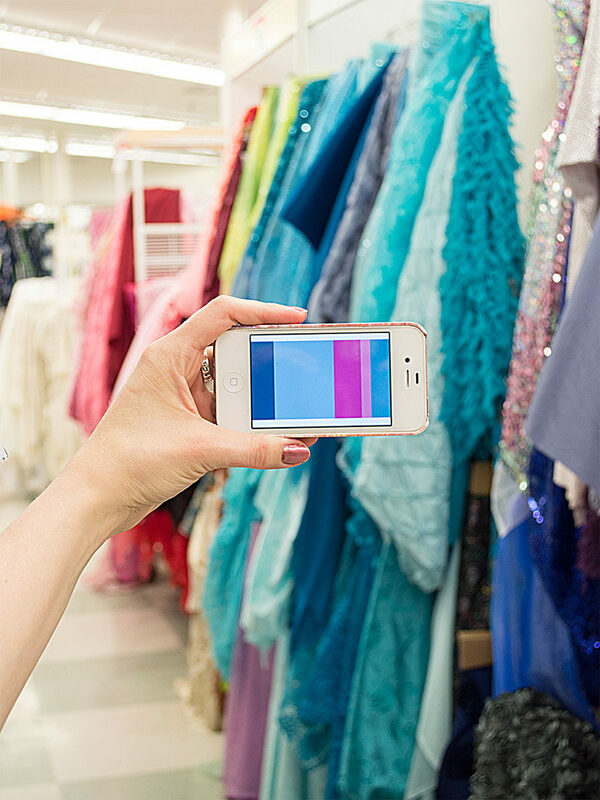 Learn how to alter yardage with ombré dip dye and fabric manipulation, how to change the color palette in your wardrobe, and change how you think about fabric waste. We’re also very excited about this month’s patterns, as both will take you through all the changing seasons! Making the Creative Shift: Creative practices not only develop new skills, they also change who we are as humans. The Seamworker’s Guide to Fashion Museums: Take a tour of the best Museums fashion has to offer, by Charlotte Powell. Sewing Specifics: Manipulate your fabric for custom yardage. 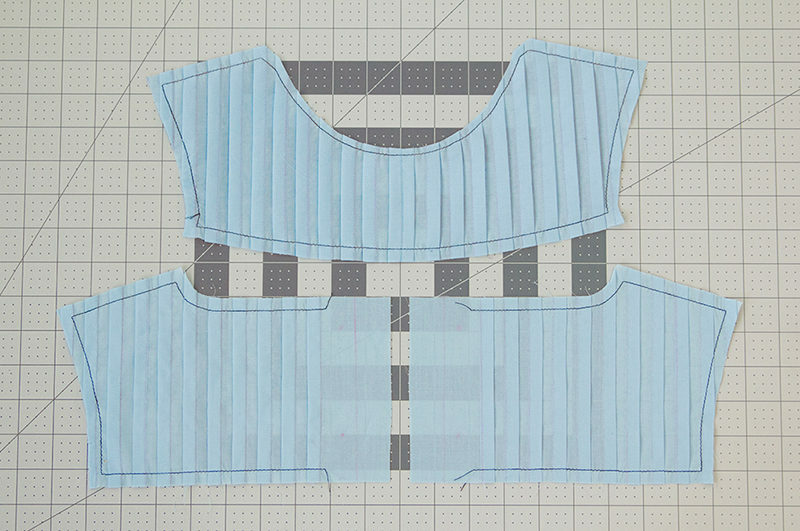 Block Paper Scissors: Create a simplified Lynn dress, by Anna Aguirre. 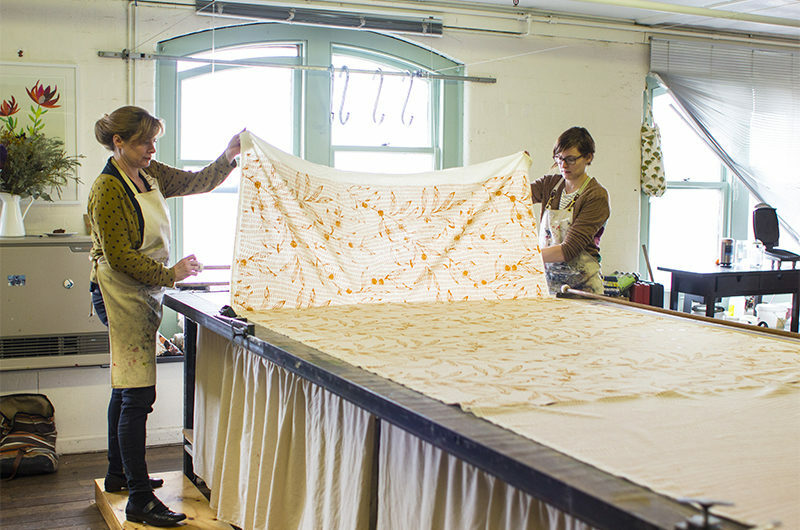 Printing Fabric with Ink & Spindle: Partners Lara and Caitlin show us how they work together to design and print their fabric line, by Sarai Mitnick. Color in Your Closet: Discover—and use—the palette within, by Lindy Thibodaux. David Bowie: The artist and the people that built the personas, by Betsy Blodgett. Ombré Dip-Dyeing: Master three variations of this gorgeous dyeing technique, by Alyson Provax. Sewing Lessons: Lifelong learning through craft, by Sallianne Hines. Zero-Waste Manufacturing: Changing how we think about fabric waste, by Jessica Yen. Handmade Beauty: Create a toning and nourishing crumbled clay mask, by Kat Siddle. Resources: Where to get fabric and supplies, as well as recommended additional reading for this issue. Have you been looking for the perfect, multi-season cardigan? Look no further, because Elmira has got you covered! This fitted, cropped, ballet-style wrap will keep you stylish through the seasons. In a lightweight jersey, Elmira is just right for summer and spring. In fall and winter, try a medium weight sweater knit or French terry for a cozier version. Elmira is the perfect match to many wardrobe staples. Try pairing this wrap with dresses like Lynn, from this issue, for a feminine look. Alternately, pair Elmira with Weston for an easy to wear outfit with a ladylike twist. It’s the last month of summer, but you still have time for one—or two—more vacations before your fall obligations take precedence. Wherever your travels take you, Lynn is the perfect dress for traveling in both style and comfort. This shift dress boasts a tailored shape, short sleeves, and a knee grazing hemline, making it perfect for travel. Lynn also features just the right amount of ease, making this dress perfectly comfortable for long trips. Best of all, it’s a pullover! Make sure to make plenty of pit stops to show off your travel style. Lynn has plenty of options for customizing, such as the contrast front and back yoke, center back placket, and bias binding along the neckline. 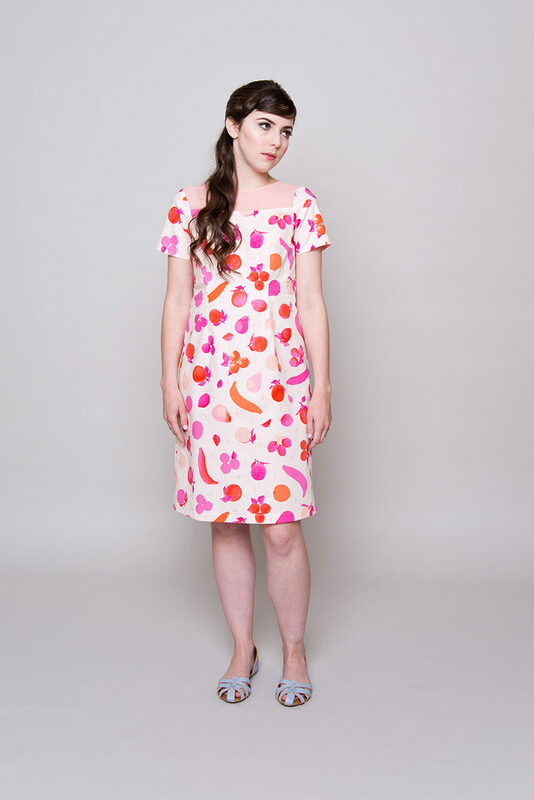 Make Lynn in a colorful printed quilting-weight cotton with a Georgette yoke and fun buttons, like we did. Is subtle more your style? 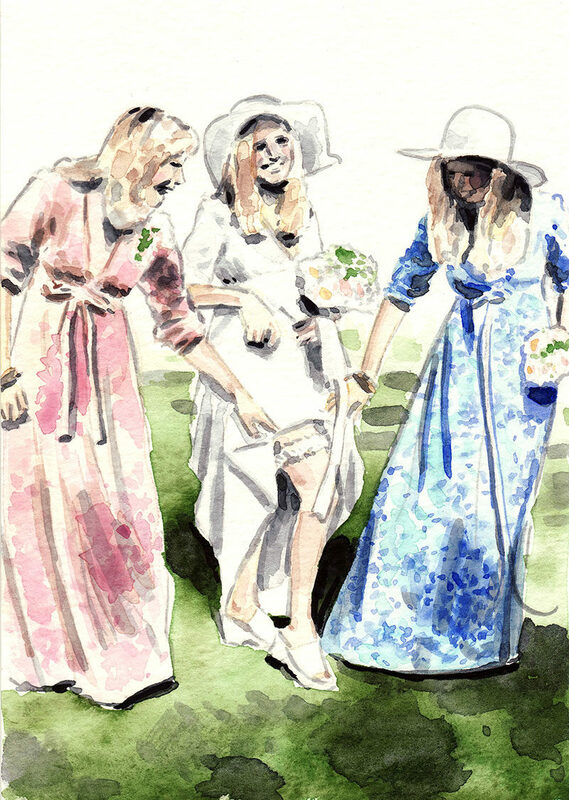 Make Lynn up in a solid color linen and a matching lace yoke for a classic dress you’ll want to wear year-round. This versatile wardrobe staple is perfect for any situation, from office, to cocktails, to vacations. I absolutely adore these two patterns! I really like the vintage touch to them. I have had “Ballet-style wrap cardigan” on my pattern wishlist for a looooong time now – and Elmira is the perfect pattern to fit the bill! I was a ballet dancer as a teen and often think wistfully of the gauzy black wrap sweater I was allowed to wear during pointe class, or until my body was properly warm (ballet dress codes are quite strict). Although my first Elmira will probably be made up in charcoal grey sweater knit, I love this bright example and will likely follow suit! So happy to hear that. I’d love to see your cardigan when you’re finished! The wrap cardigan is very pretty and practical-looking, and will definitely be finding its way onto my list of projects. I’ll pass on the dress – doing up back zips is hard enough, and back buttons are practically impossible, not to mention very uncomfortable to lean against when sitting. The last thing I’d wear when travelling, TBH. Hi Pelly! So glad that you like Elmira, it is such a great pattern! If the style of Lynn appeals to you, but back buttons aren’t your thing, check out Block Paper Scissors. This month, Anna walks you through eliminating the placket and buttons. They are non-essential since Lynn is a pullover dress. Thank you for the feedback and happy sewing! Hi Betty, I really appreciate your suggestion. We will add that detail to the product description ASAP. I love the idea of eliminating the back bottons, but hate to give up the three part structure – color blocking! Would it be possible to keep the bodice and skirt separate, and remove the button placket? I’ve read and re-read Block Paper Scissors and am still not clear as to why the bodice and skirt pattern pieces are merged. You can definitely still keep the bodice and skirt separate! Just follow steps 1 & 2 to eliminate the buttons. The Block Paper Scissors article just adds more steps to simplify in case you want a one-piece shift dress. Would this tutorial work for removing plackets in other patterns too? As long as the garment is constructed in a similar way, yes. Just pay attention to the seam allowance that your pattern uses! The Elmira and Lynn are both very cute! I like Lynn’s contrast yoke a lot. Good work! Looks like a great issue, and I’m looking forward to reading it. Just wondering what fabric you used for the Brooklyn skirt in this issue? So pretty! Hey Amy! Here is the fabric we used for Brooklyn :).